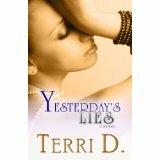 ***AUTHOR GERI AHEARN'S BOOK REVIEWS***: ~~Welcome TERRI D.~~Author Of: "YESTERDAY'S LIES"
~~Welcome TERRI D.~~Author Of: "YESTERDAY'S LIES"
When I meet people, one of the first things they ask is, where are you from? Or, did you grow up in Harrisburg, which is where I currently live. I have a very hard time answering the first question. I was born in Detroit, Michigan, but don't remember it, since I literally only stayed there about a week or so after I was born. I spent most of my life in Washington D.C., Suburban Maryland area until the age of twelve, when I left home and went to Virginia to attend a boarding school from grade nine to twelve. Every year that I was in boarding school, I came home in the summer to a different city, Washington D.C;Charlotte;North Carolina, and finally Harrisburg, PA. When I tell people that, they often ask if my parents were in the military. I laugh, and say no! My mother was just finding herself. So, where am I from? I have now officially lived in Harrisburg PA longer than anywhere else, so this is home. I am a single mother of three. I once read that children bring our subconscious issues into life. They show us the parts of us that we need to heal. My children have always been my inspiration to push myself to get to the next level. I see little pieces of me in each of them, but they have all grown up to have their own distinct personalities. I have worked in the Healthcare industry for over twenty years. I am presently employed for a local Healthcare company, and work in the Information Systems Department. Although I work in it, I am not a 'techie' as most people consider anyone who works in this field. I consider myself to be very analytical, which makes people that I've known for a long time, wonder where all of this creativeness came from all of a sudden. To this, I say it has always been there, just hidden beneath the surface. I have kept journals as far back as I can remember. I always liked to write, and express myself in writing. I have often been told that I express myself in writing, better than I do verbally. I dabbed in poetry from time-to-time, but have always gravitated more towards music. I am a singer, and have also used that as an outlet for my creative energy. I come from a very musical family. All of our activities usually involve music in some form, or fashion. I still sing in church, as often as possible. However, my writing intensified ten years ago, while going through my divorce. It was a way for me to express myself, without exposing what was really going on inside of me. At one point, I allowed a close friend to read some of what I wrote and they commented that I had a very unique way of writing and expressing myself, they encouraged me to continue to write.